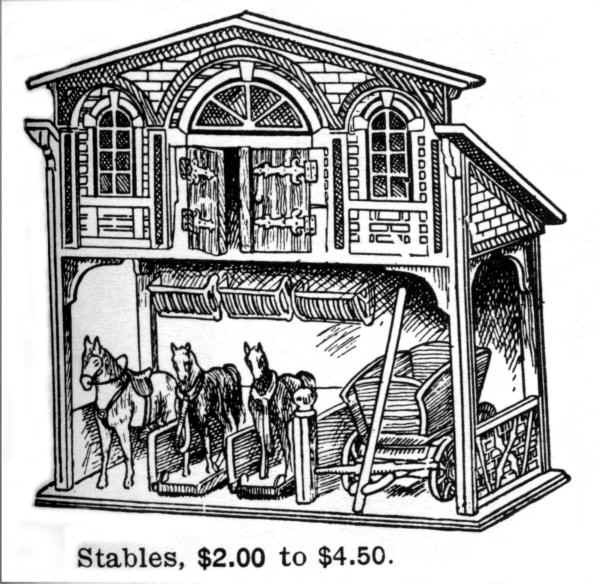 The young master stands proud with one possessive hand on his fine stable topped by quarters for the coachman and his assistants. 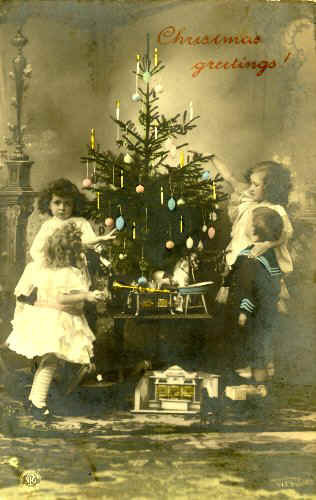 Undated postcard likely showing a German-made stable c1900. 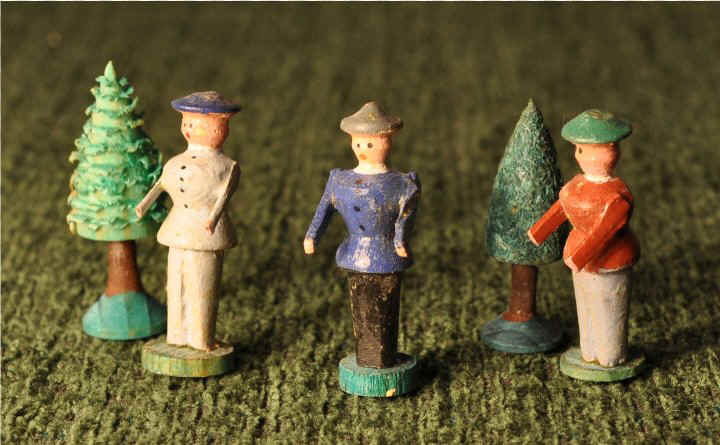 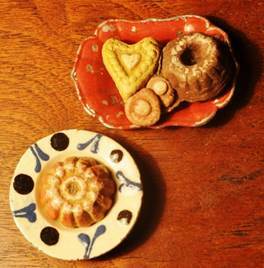 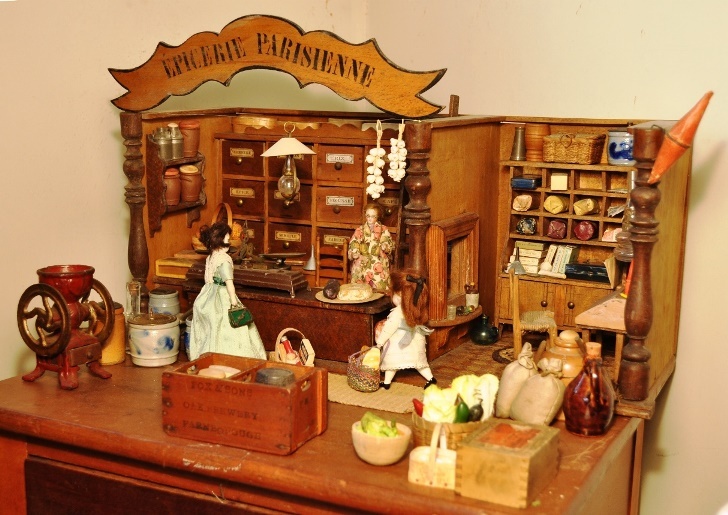 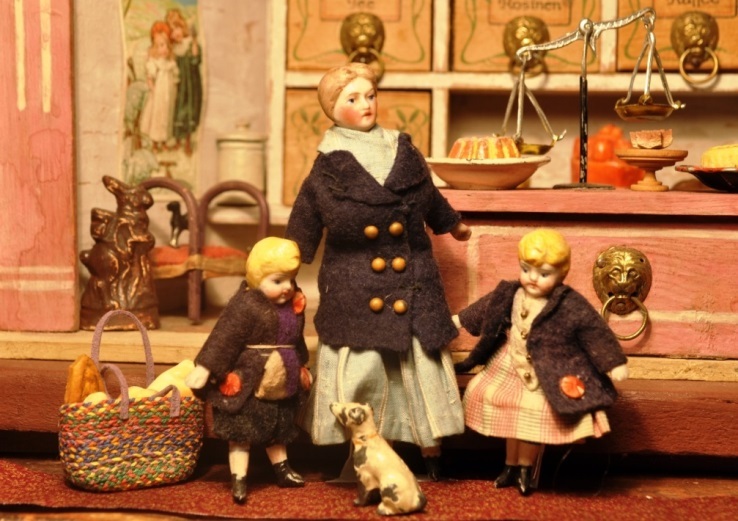 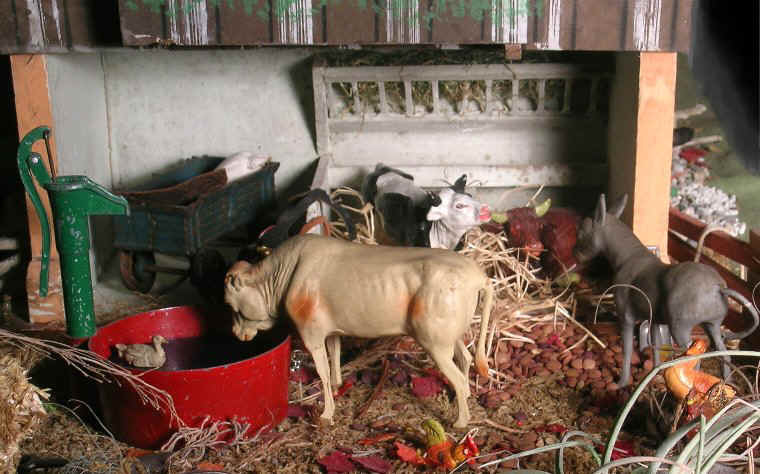 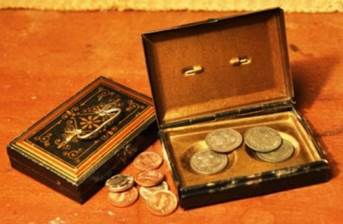 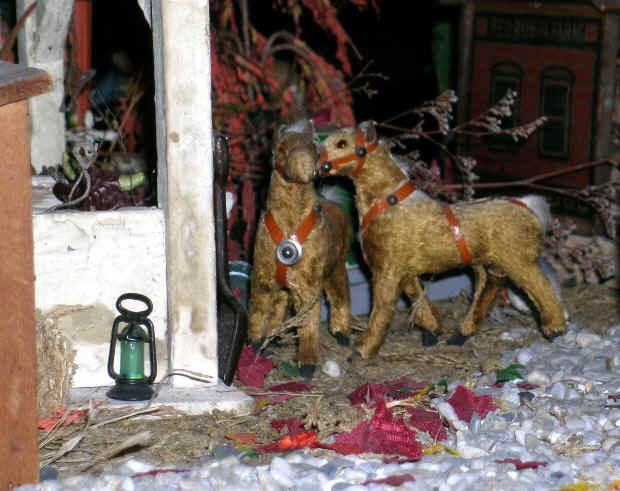 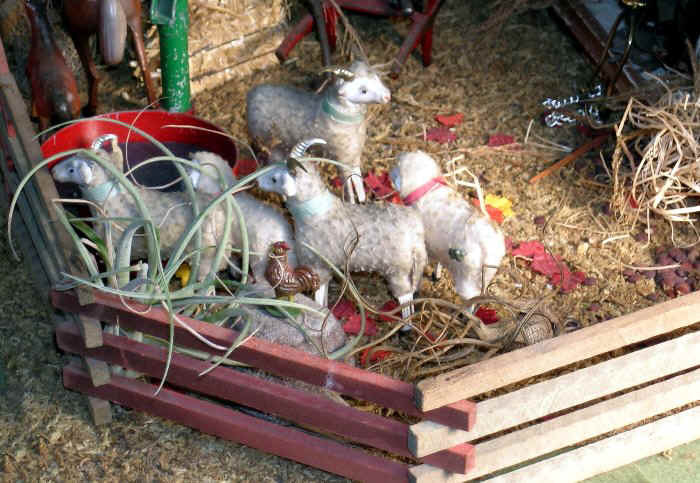 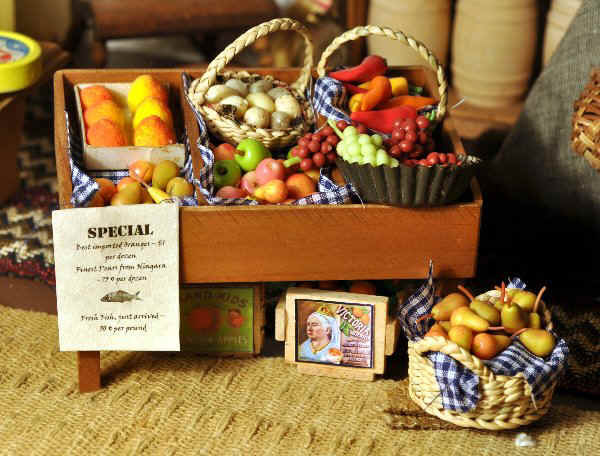 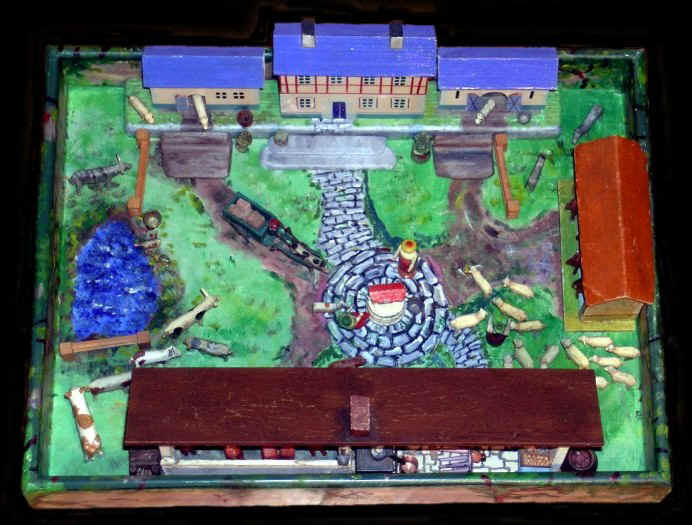 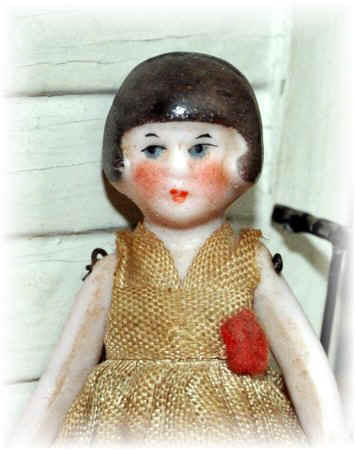 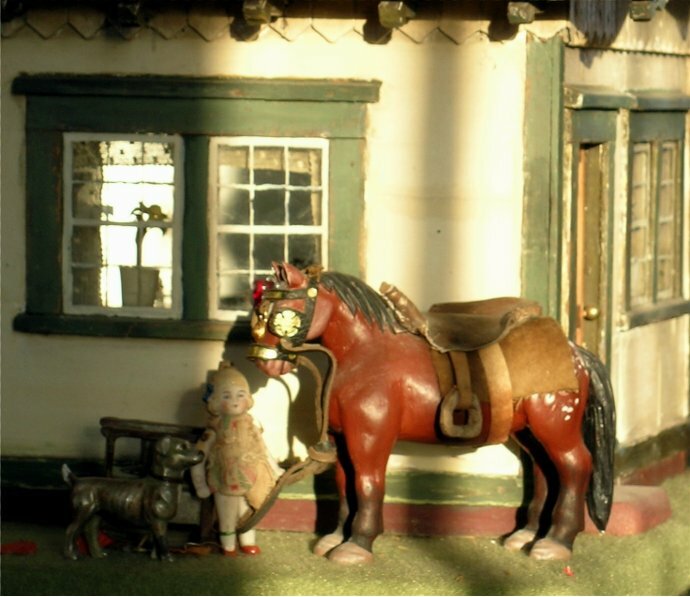 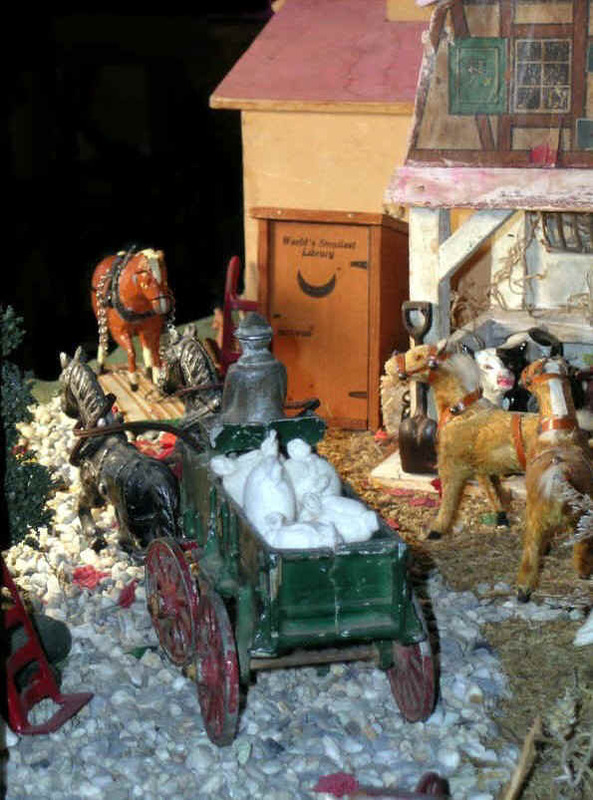 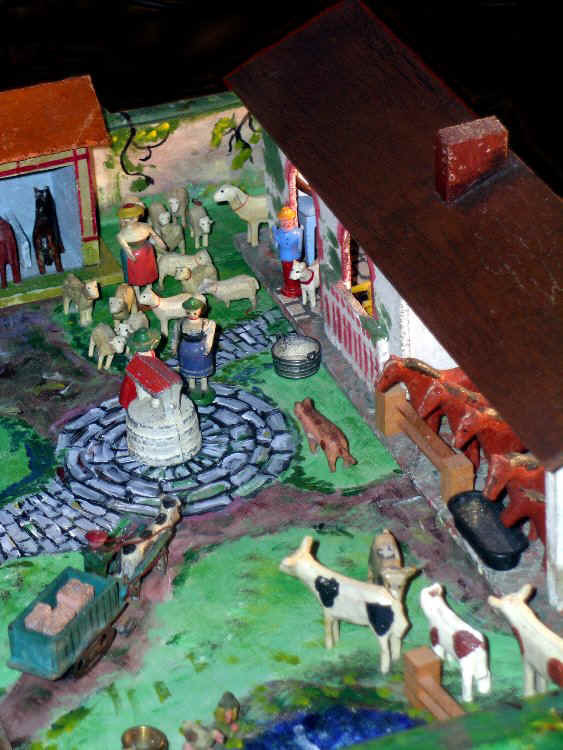 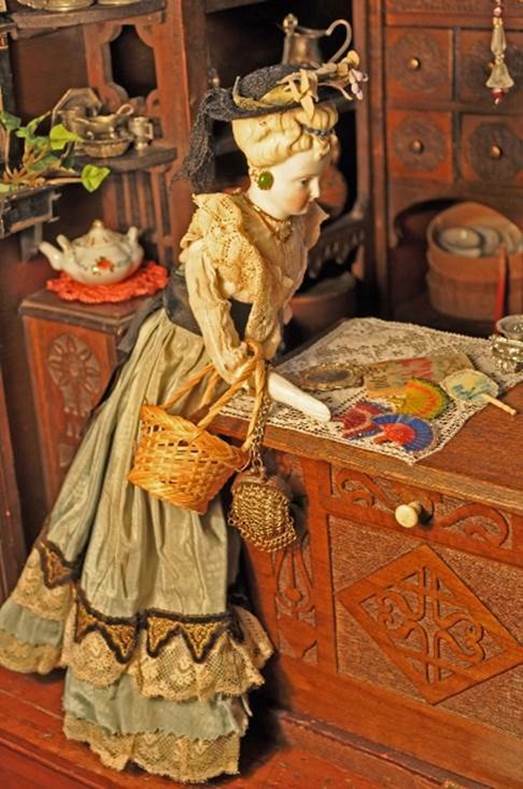 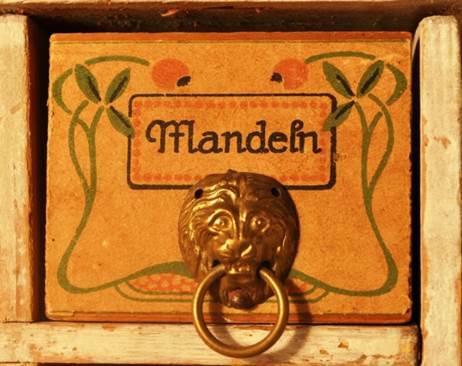 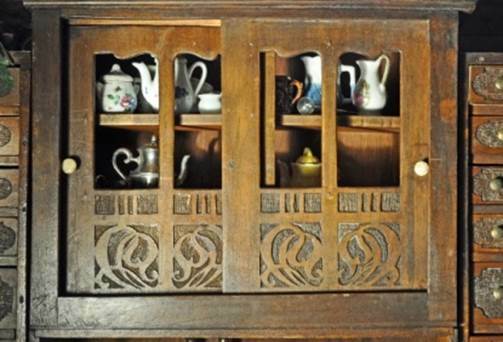 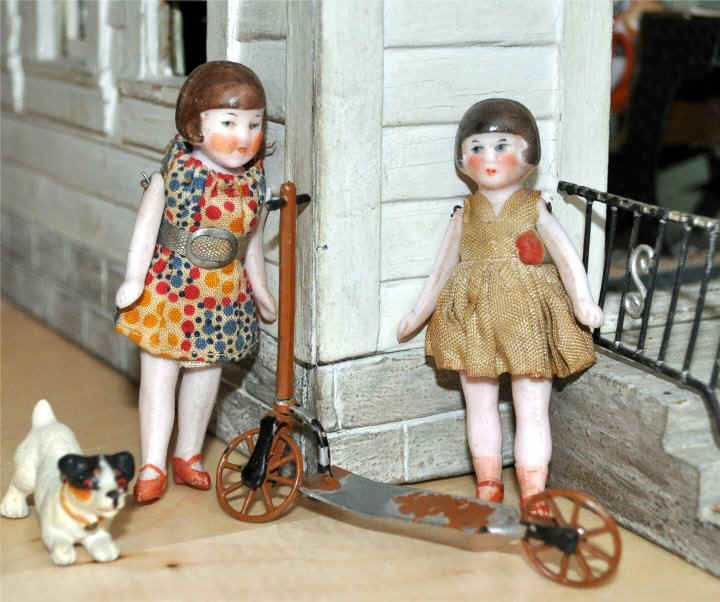 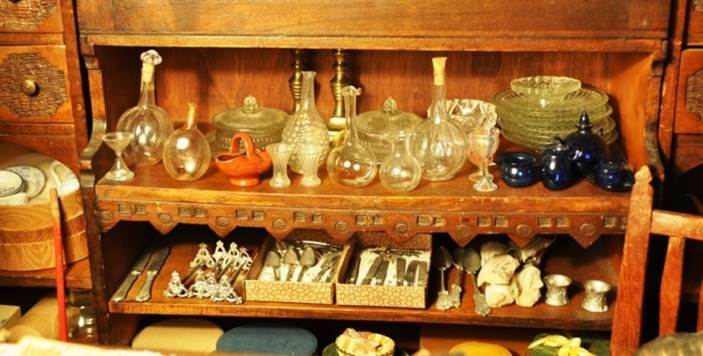 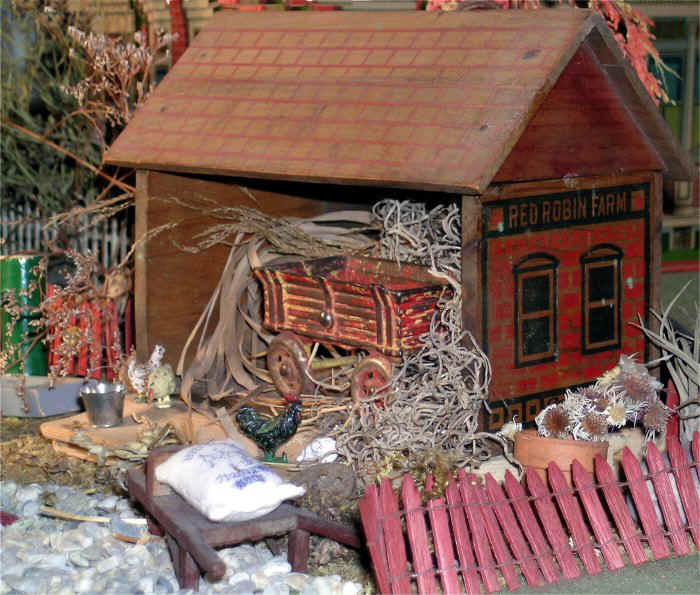 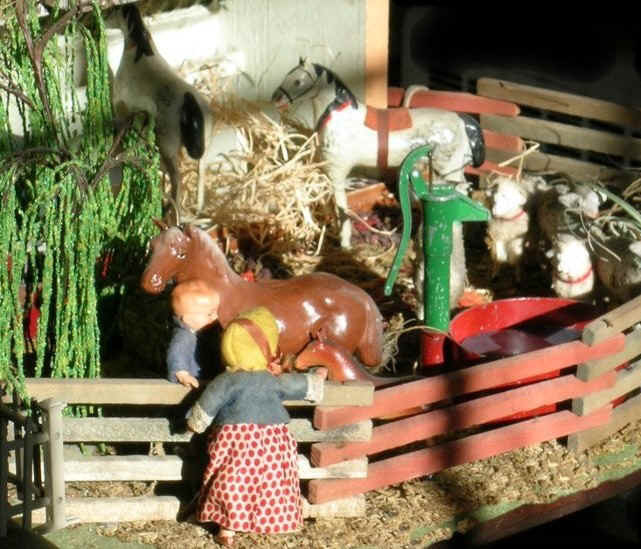 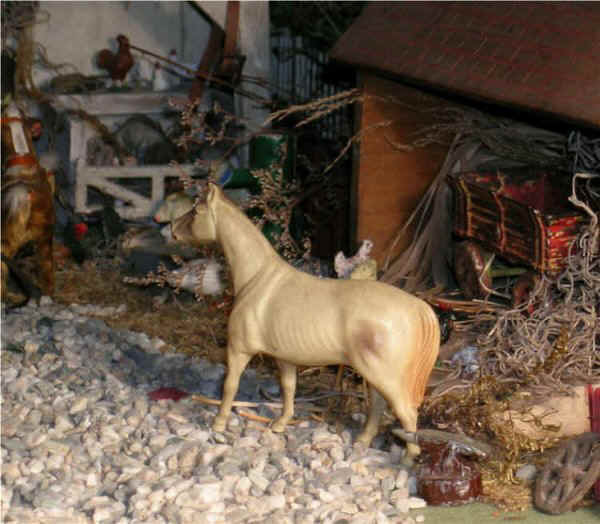 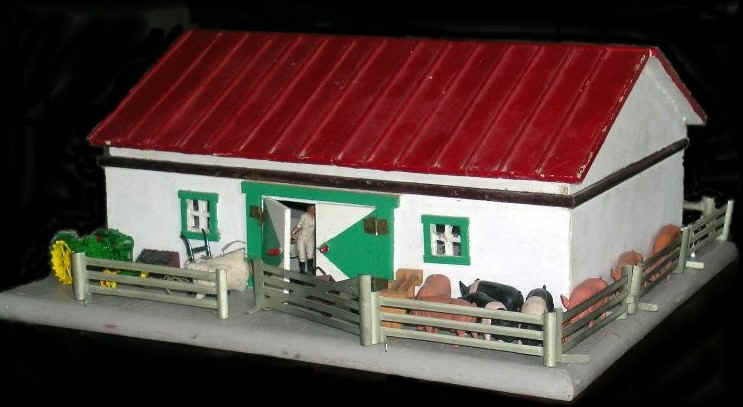 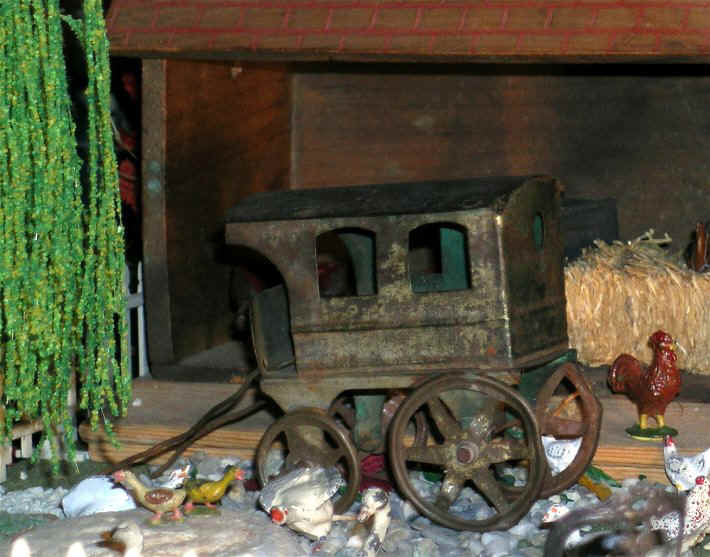 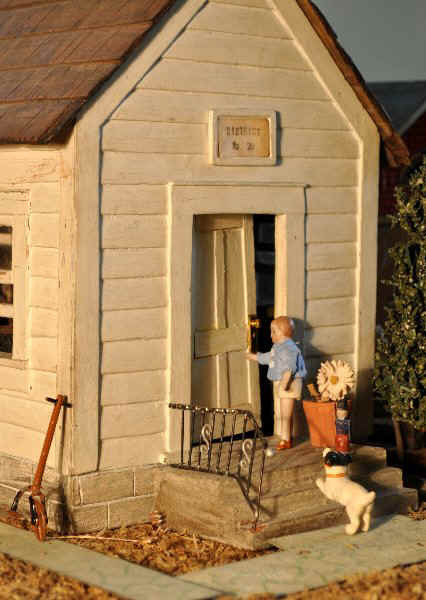 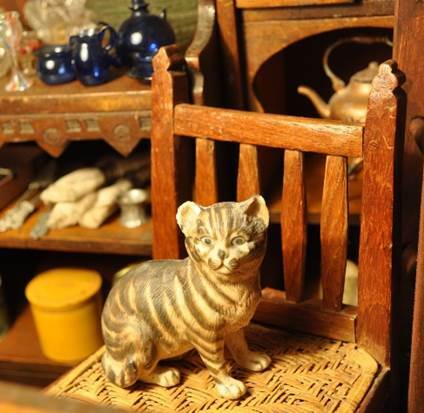 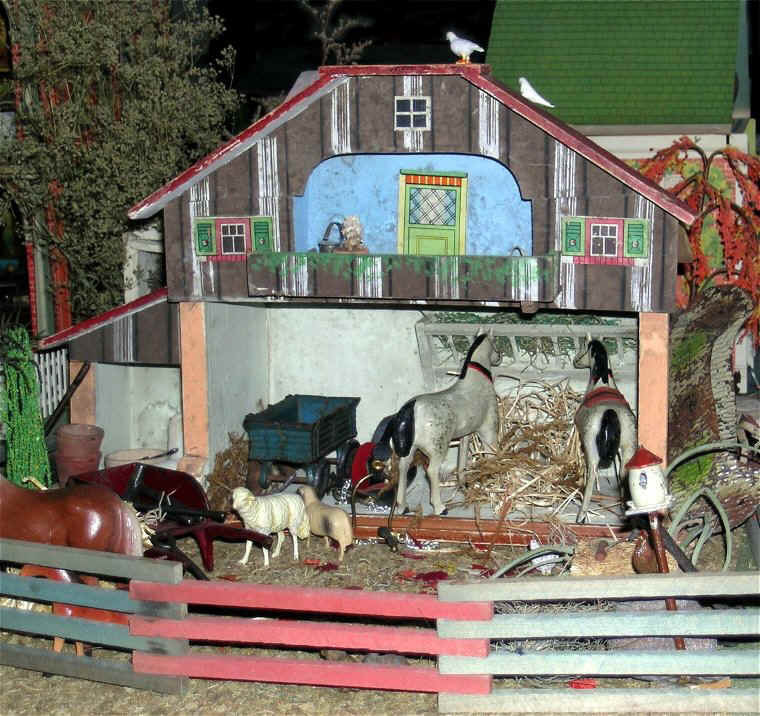 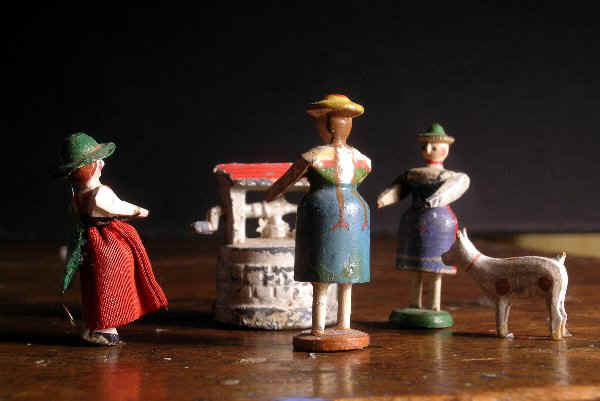 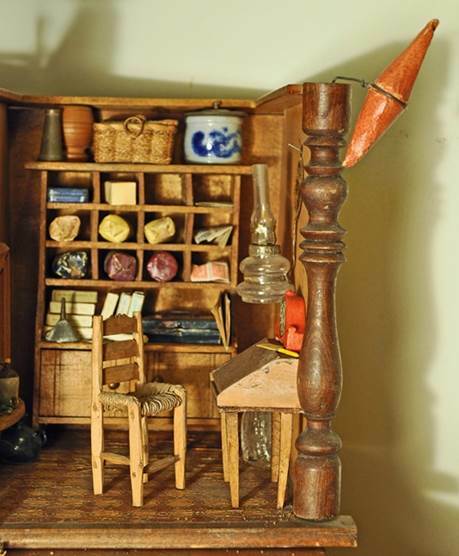 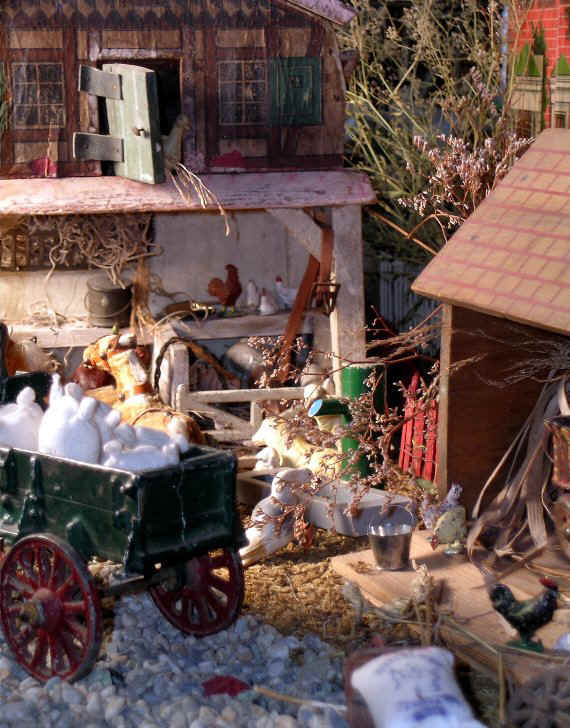 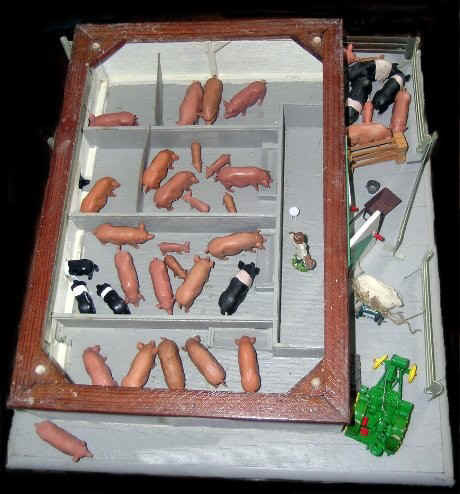 Many of these tiny painted wood items were made in the Erzgebirge area, in the eastern part of Germany. 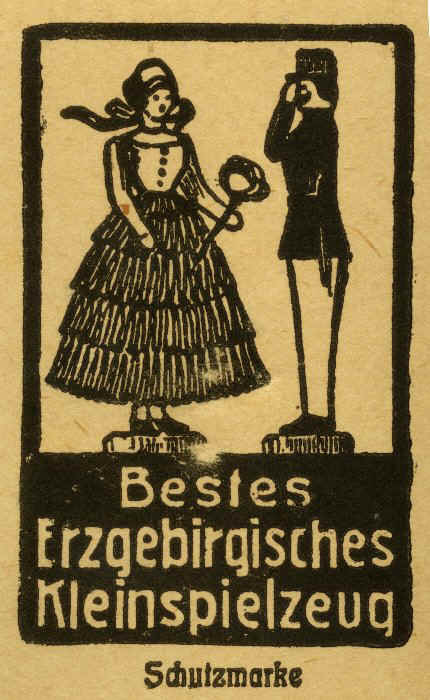 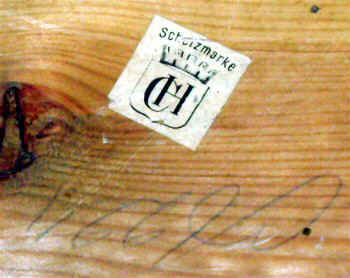 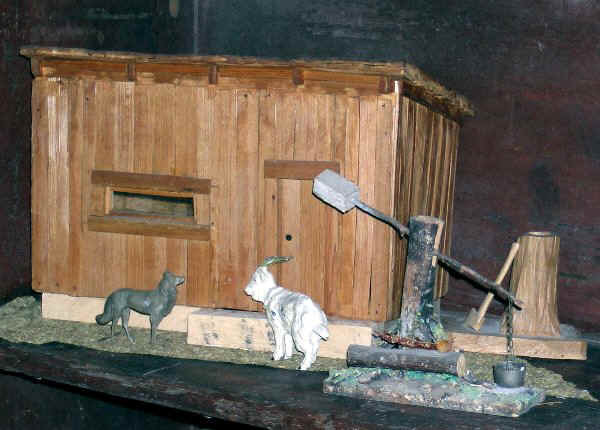 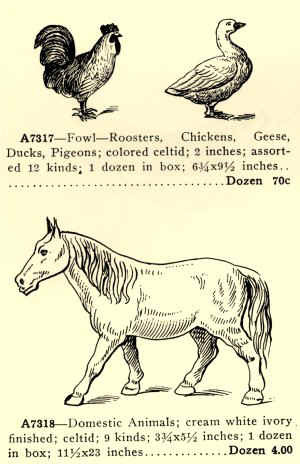 This the trademark for the "best Erzgebirge-made little playthings" (printed on a small cardboard box holding items portraying a hunting scene). 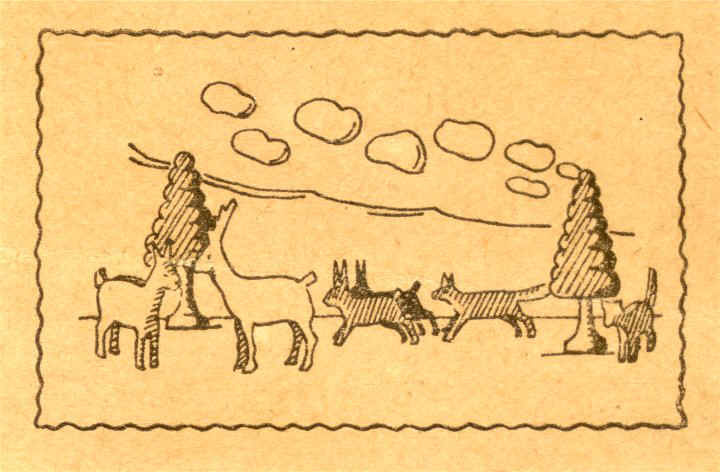 A fox is pursuing two rabbits (which admittedly look like the goats in another set). 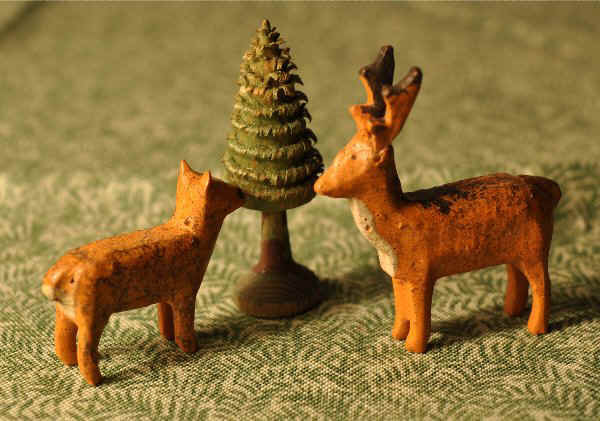 The stag is 1½ inches high. 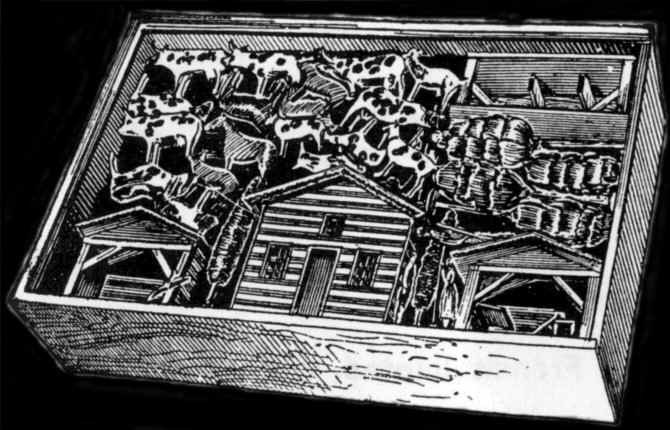 Farmers ploughing (printed on the top of a carboard box, 1.5 in. 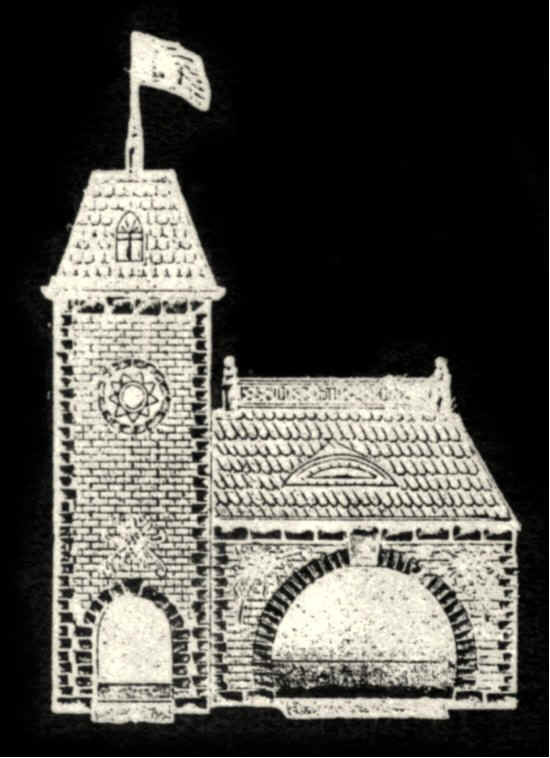 wide x 2.25 in. 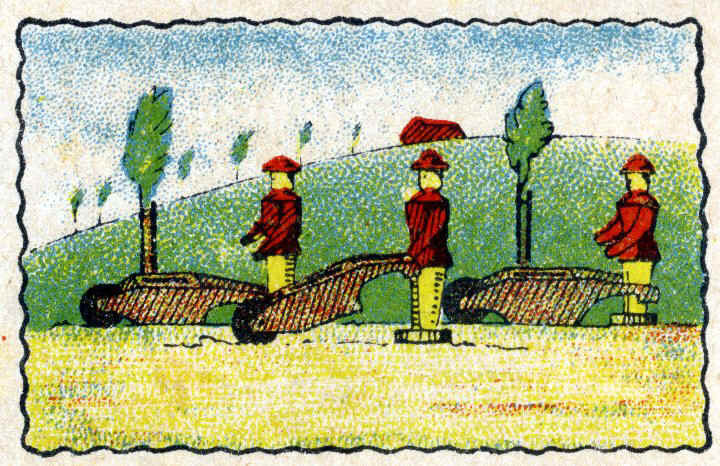 long x ¾ in. 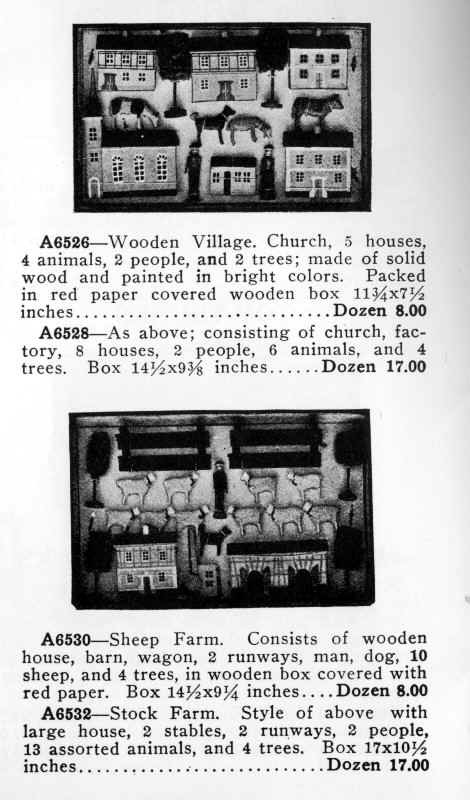 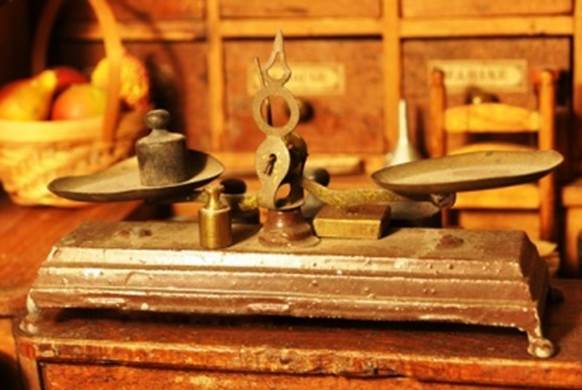 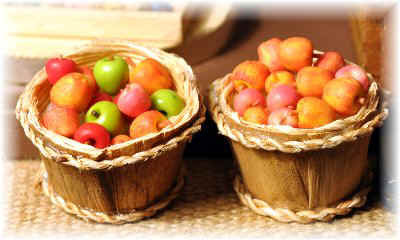 deep, holding the set below; men each 1¼ in. 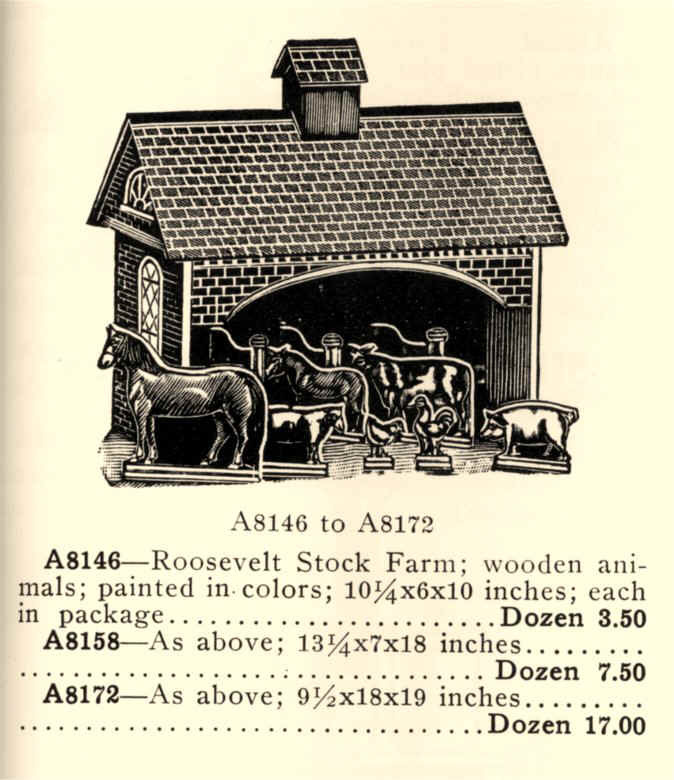 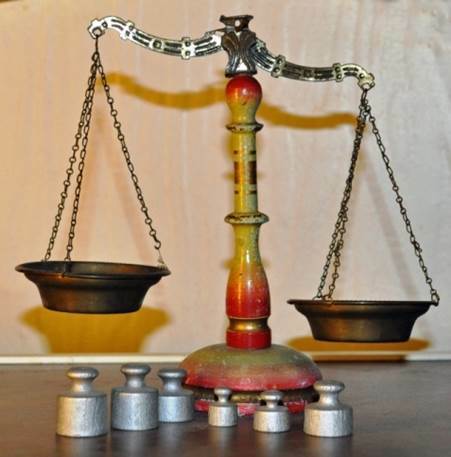 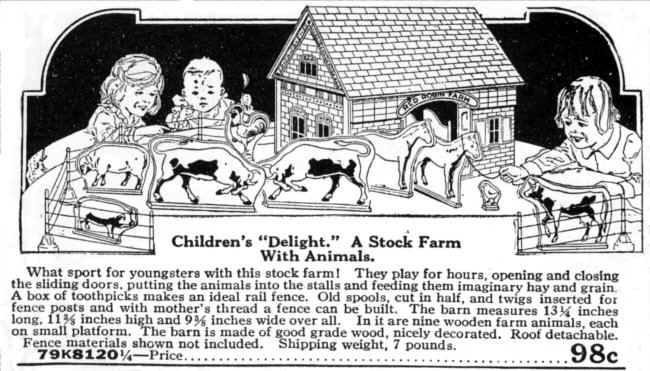 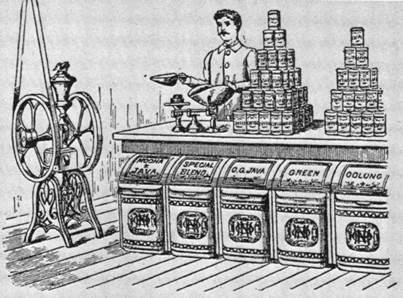 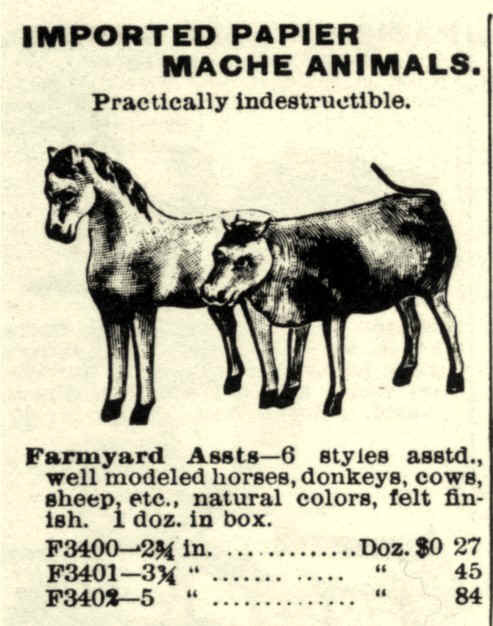 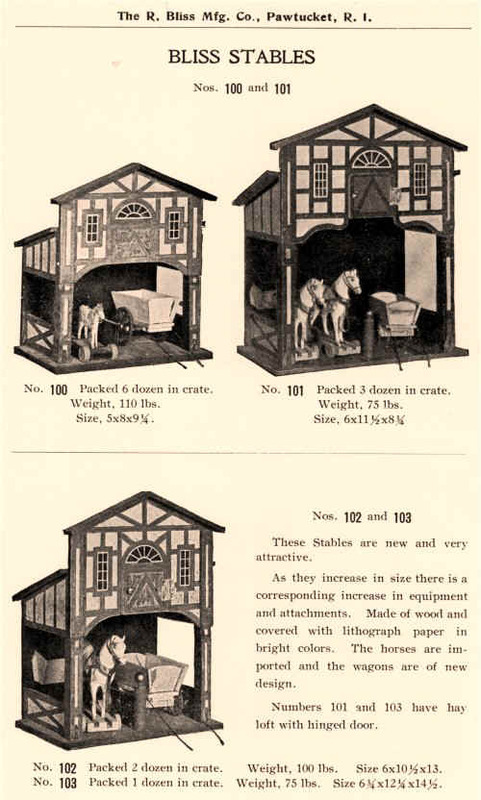 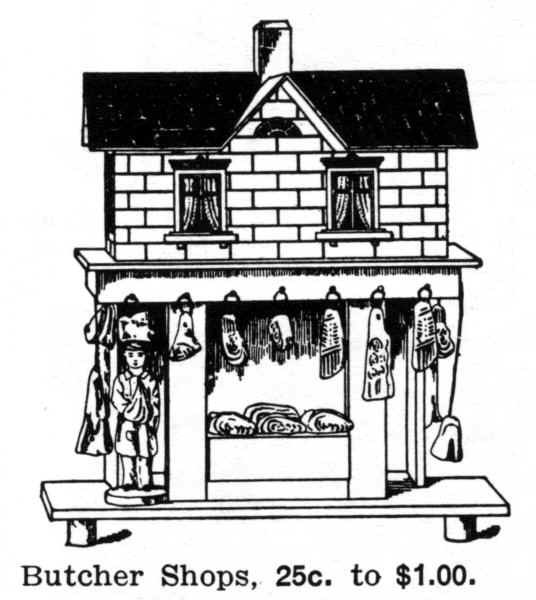 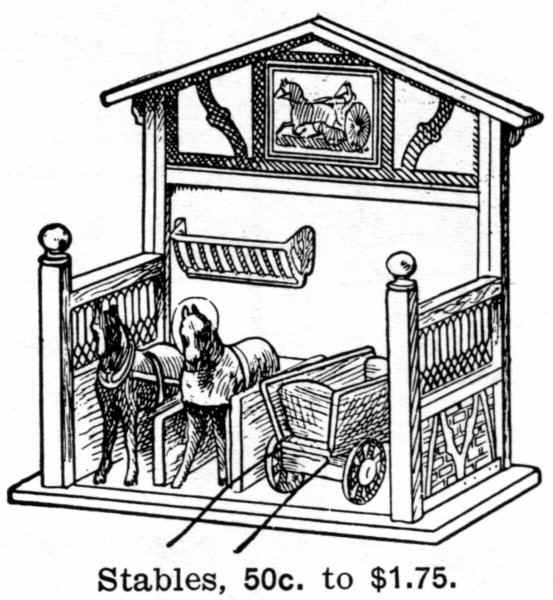 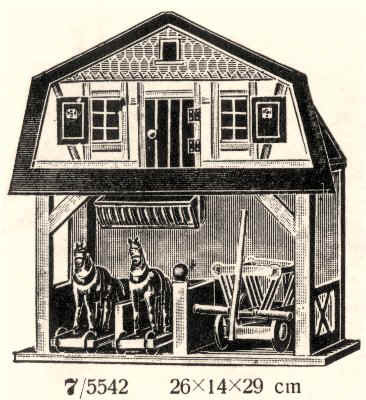 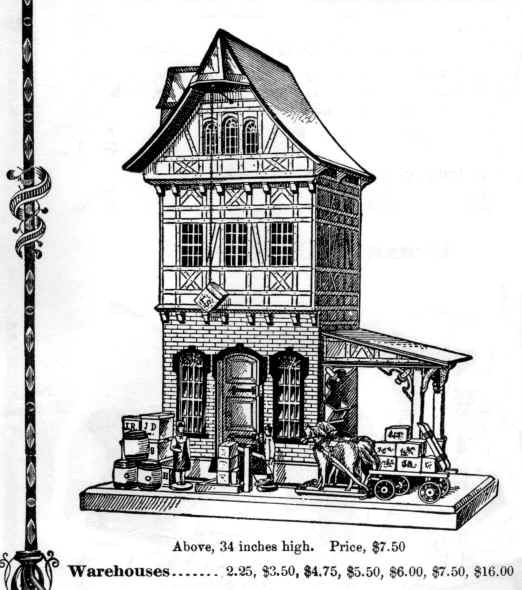 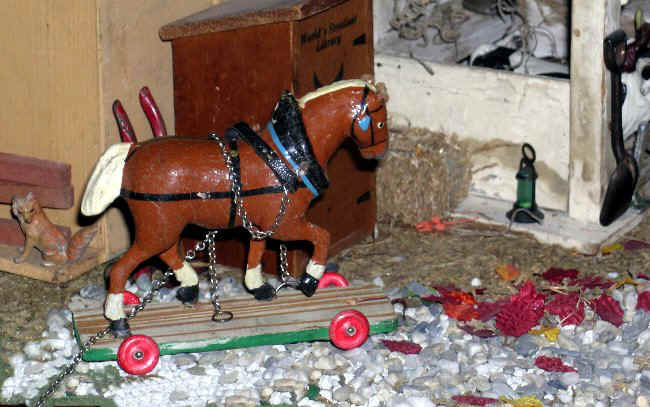 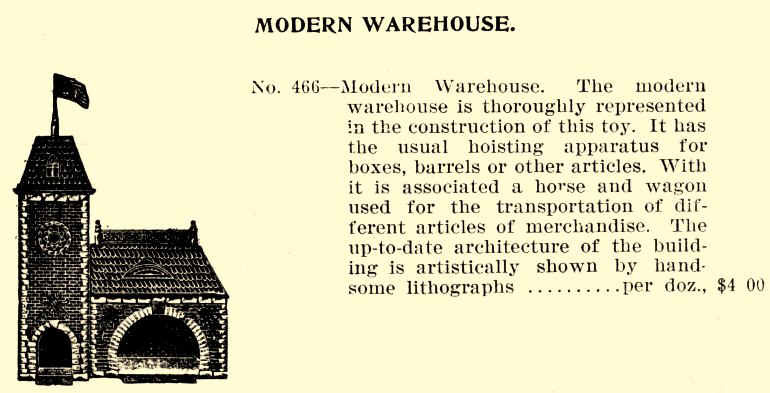 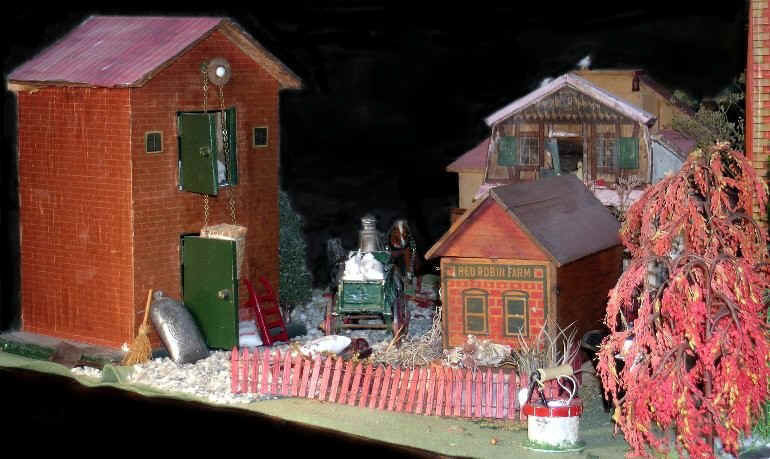 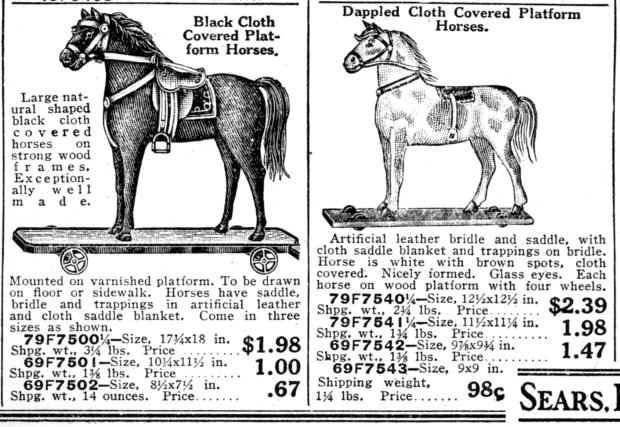 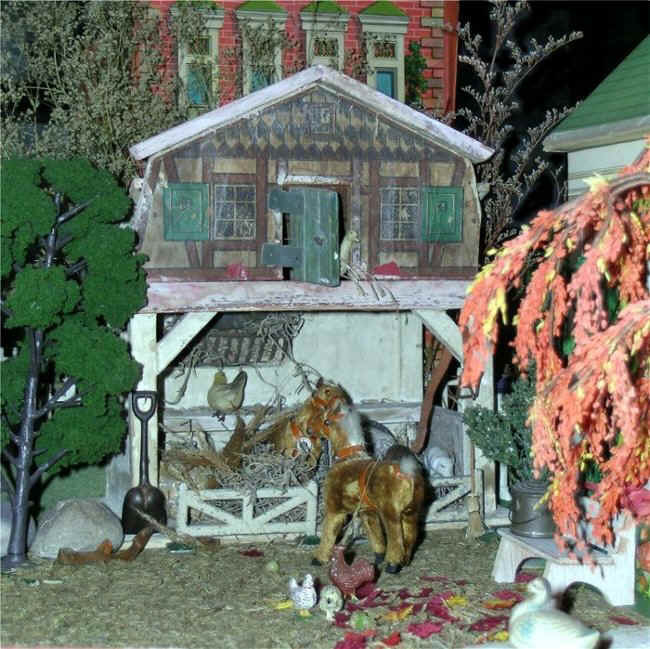 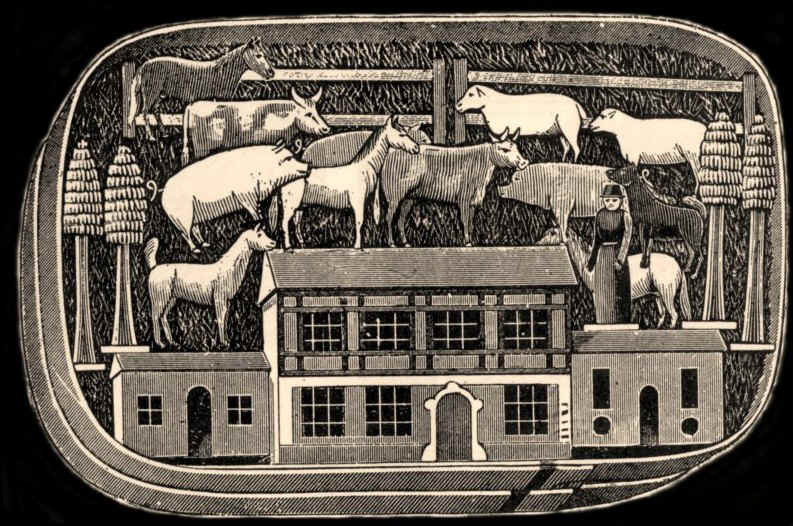 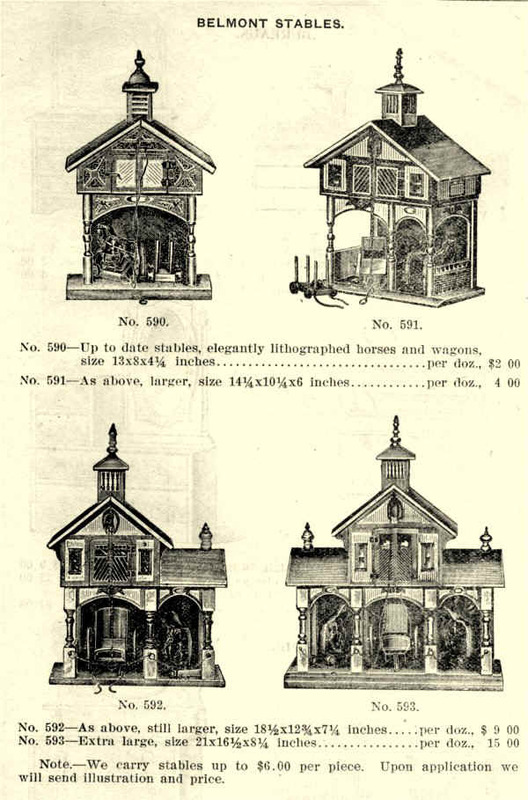 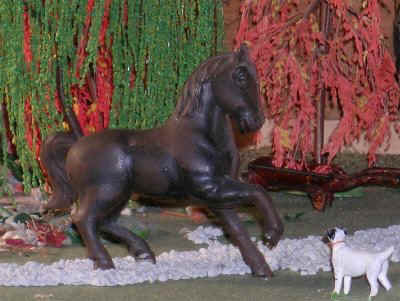 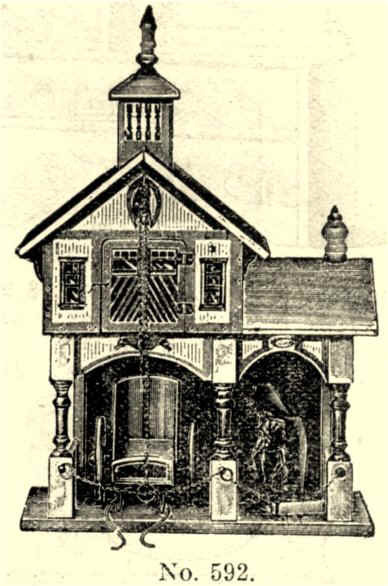 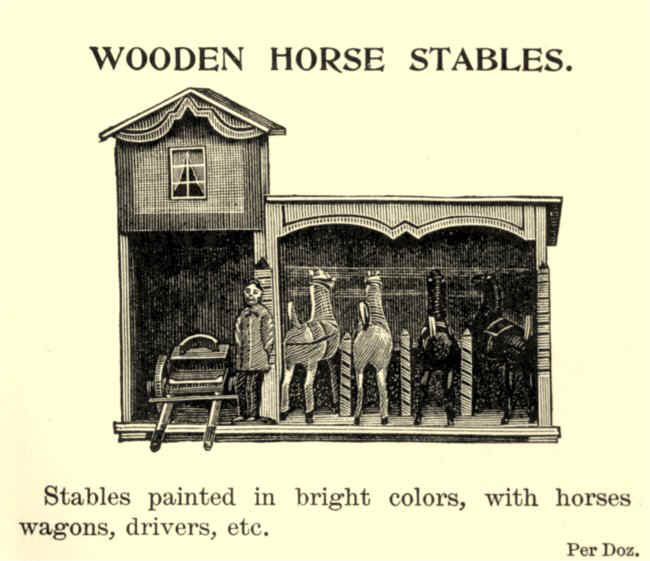 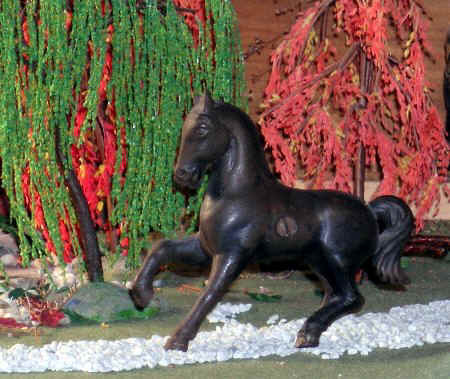 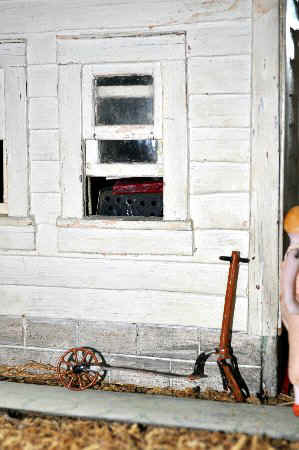 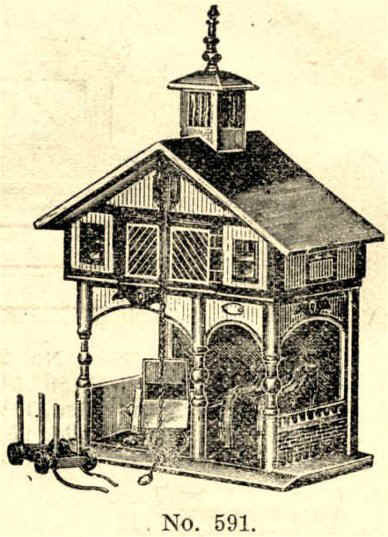 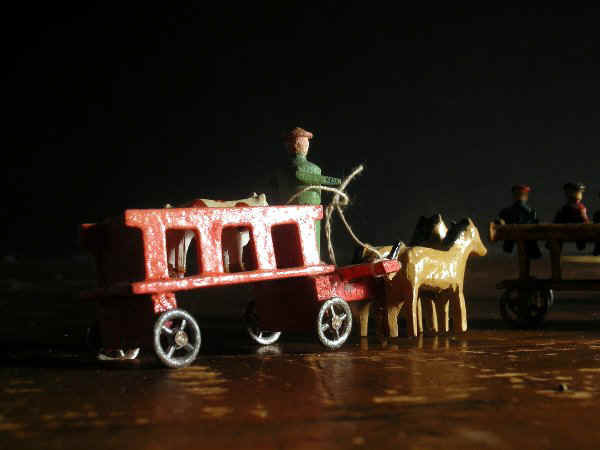 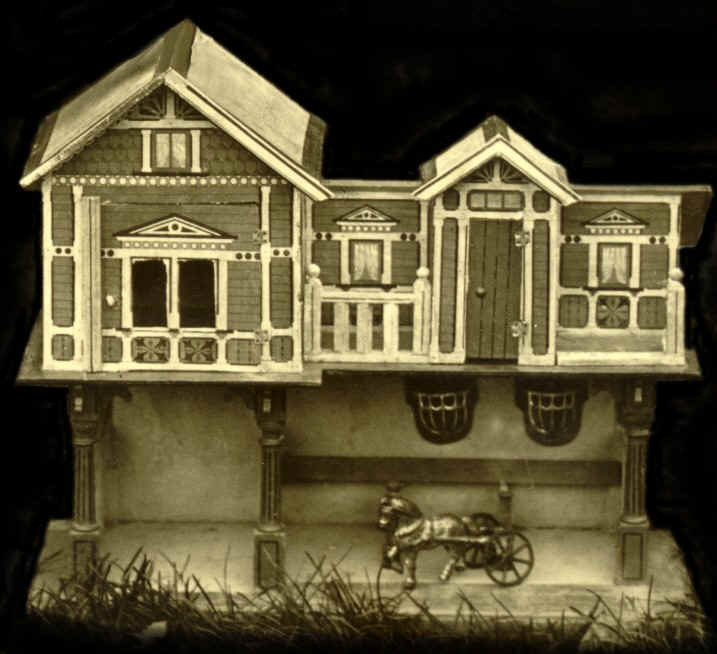 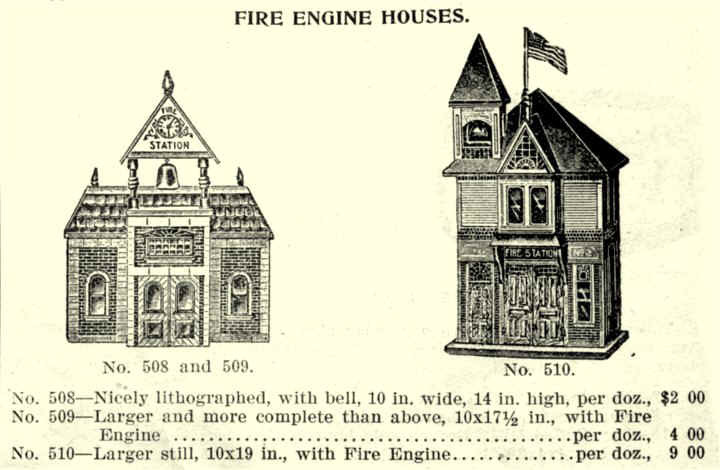 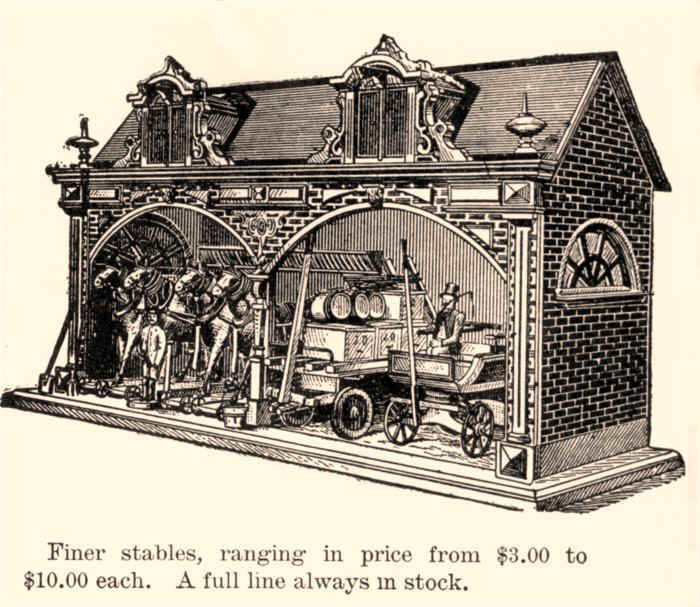 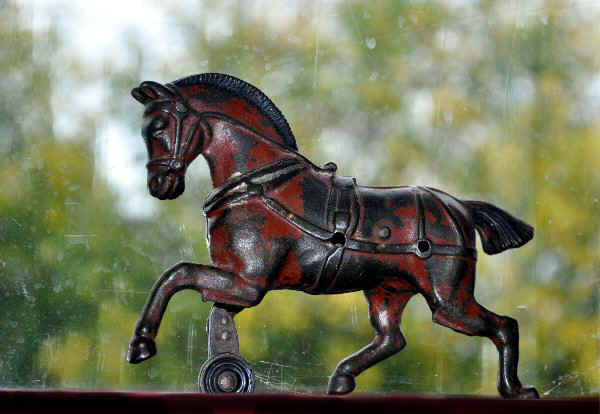 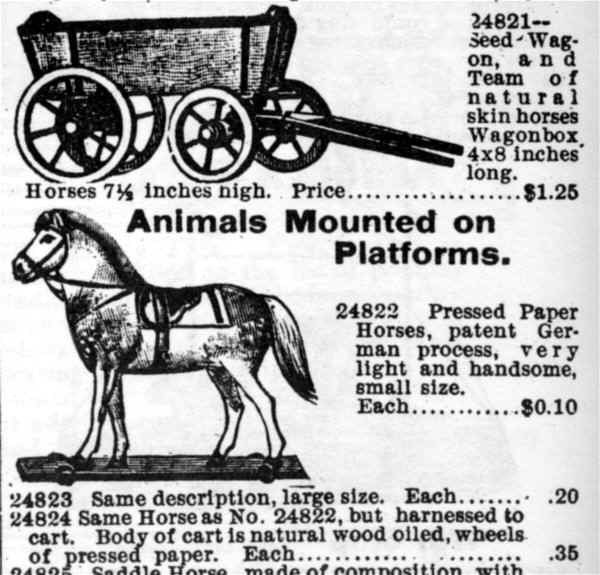 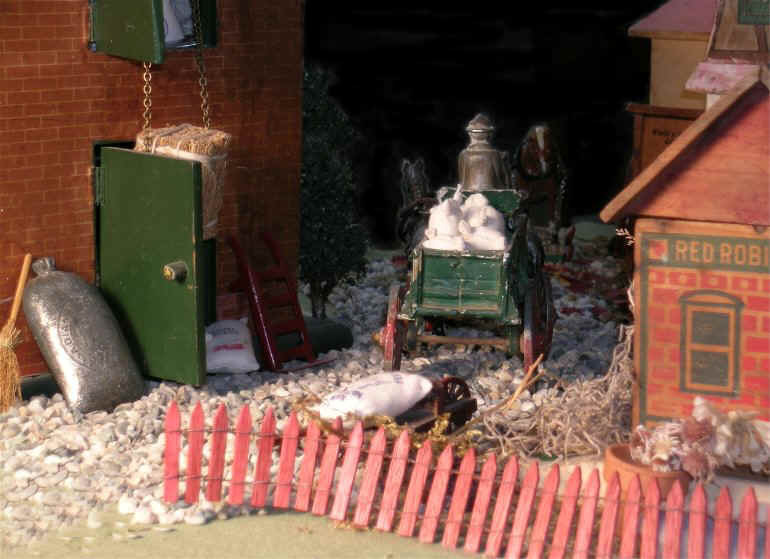 high) "The best wooden Miniature Toys"
11908-1909 Nerlich & Co. catalogue, Toronto, Canada, black painted iron horse pulling a steel cart, overall length 6½"
It has similarities to the German sweet shop illustrated below. 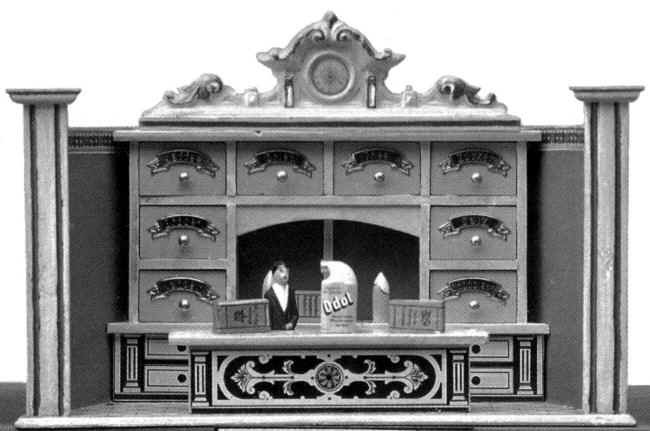 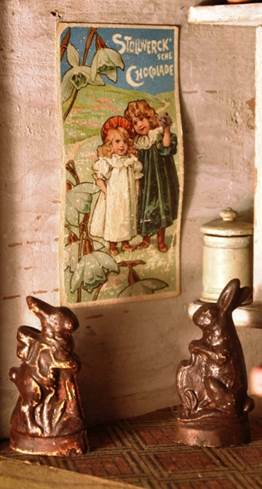 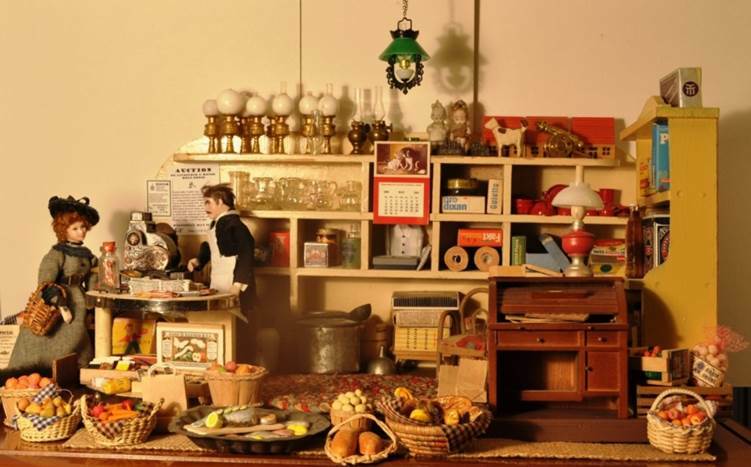 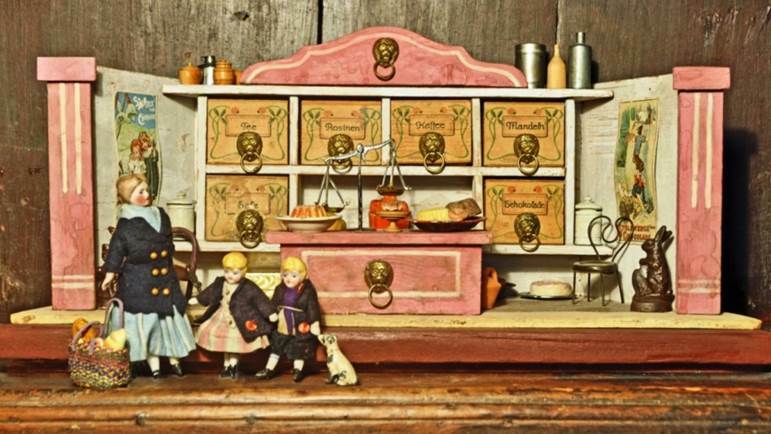 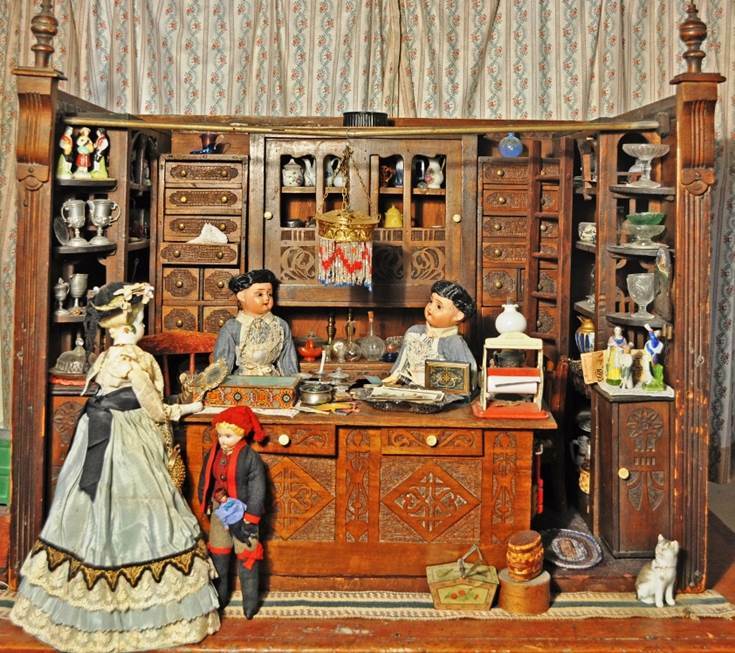 German sweet shop with original decoration, cakes, lion face drawer pulls, scales, mother and twins (in original clothing), posters and “chocolate” rabbits; the shop’s base is 17 inches wide. 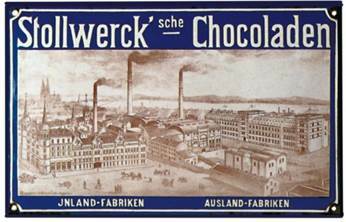 The “posters” or cards date from 1900 labelled Stollwerck ‘sche Chocolade, a company headed from 1883 to 1922 by Ludwig Stollwerck (1857-1922) in Cologne. 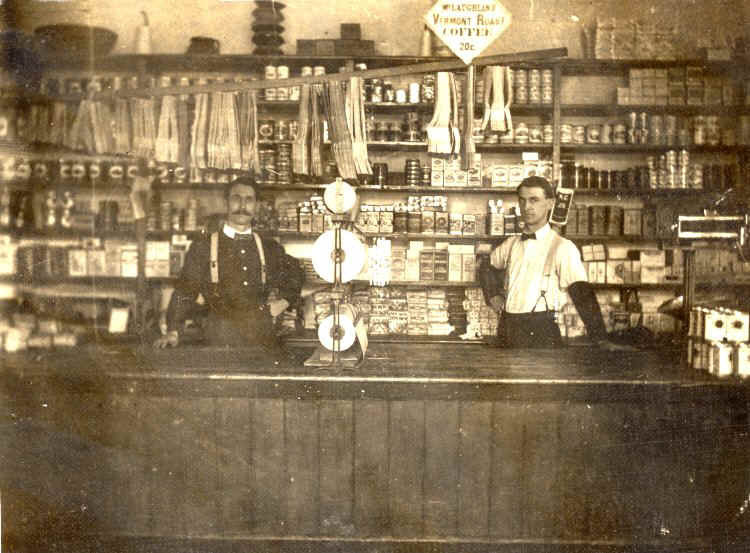 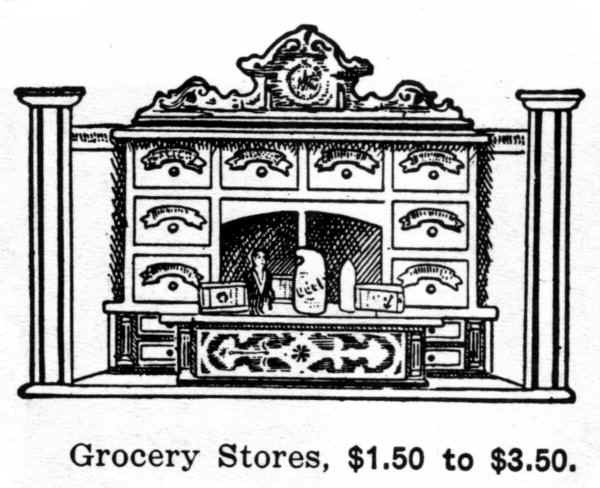 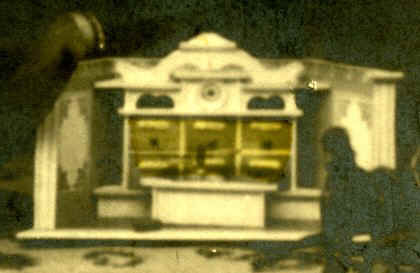 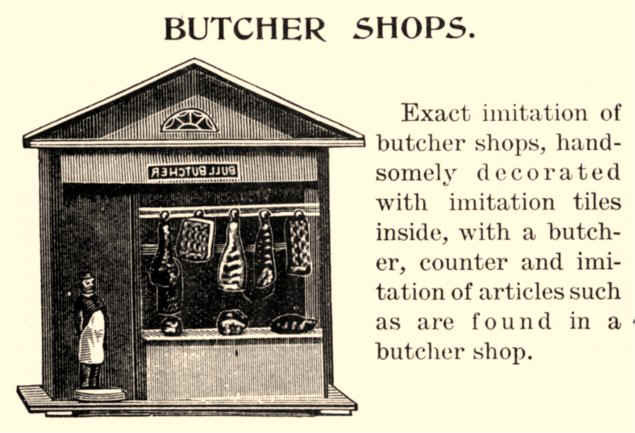 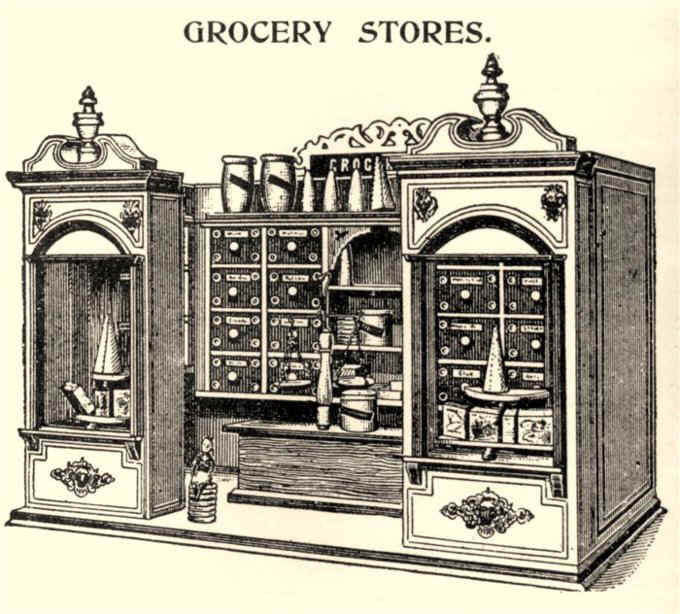 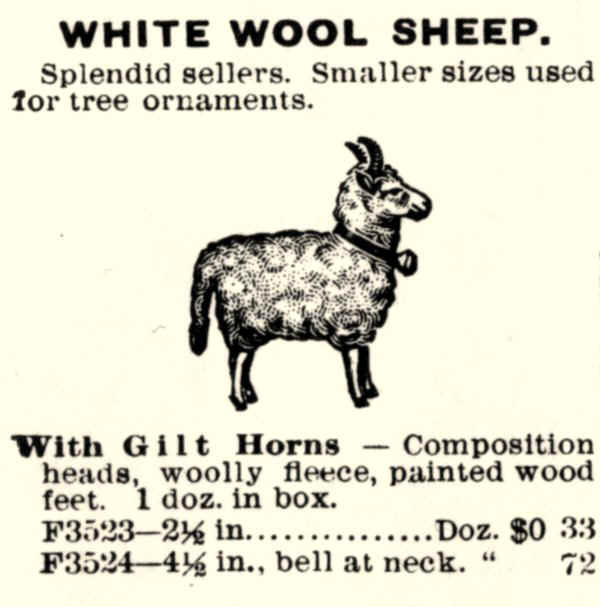 A real store interior from the early 20th century, Canadian or American, undated postcard. 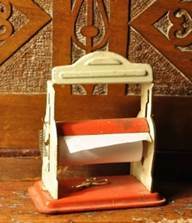 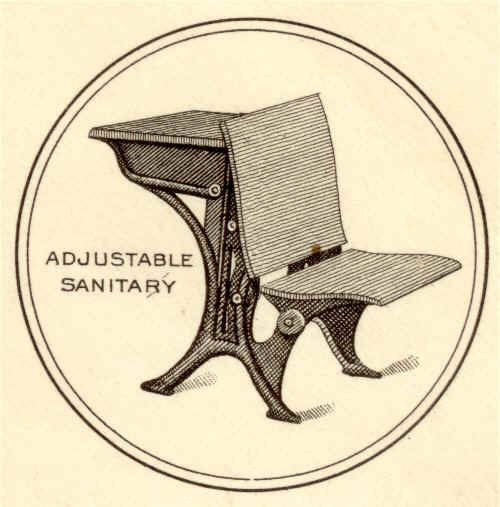 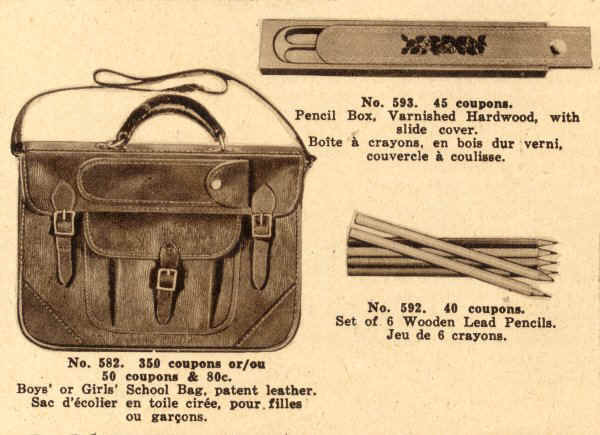 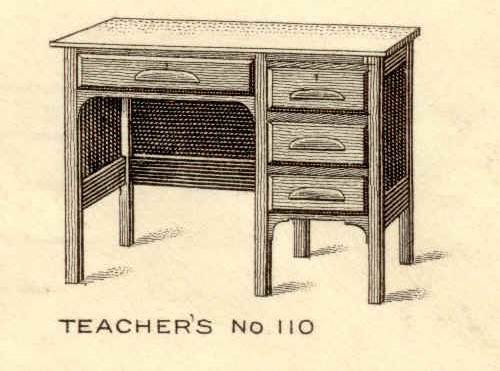 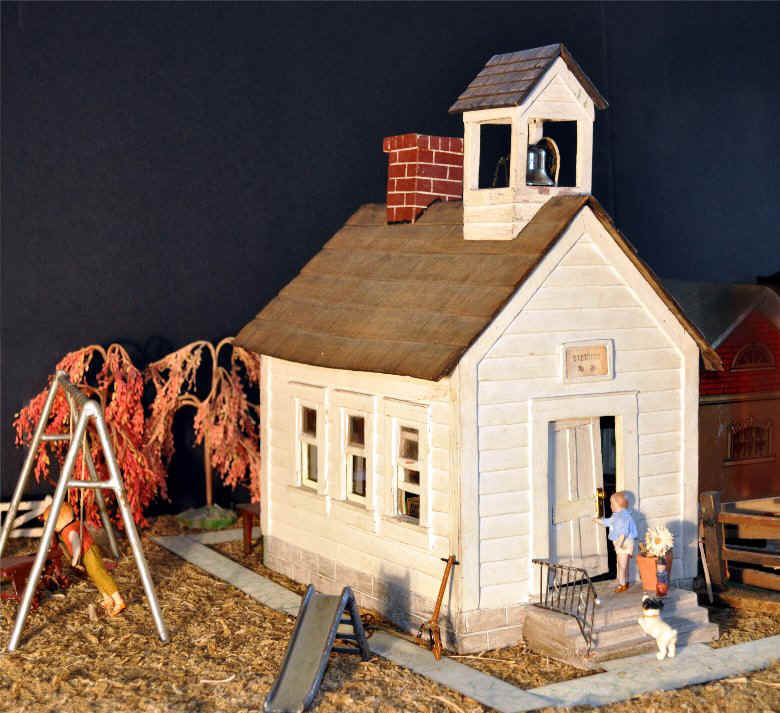 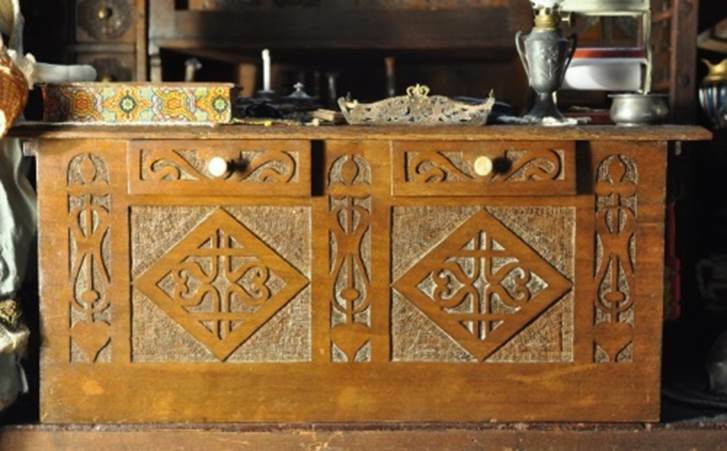 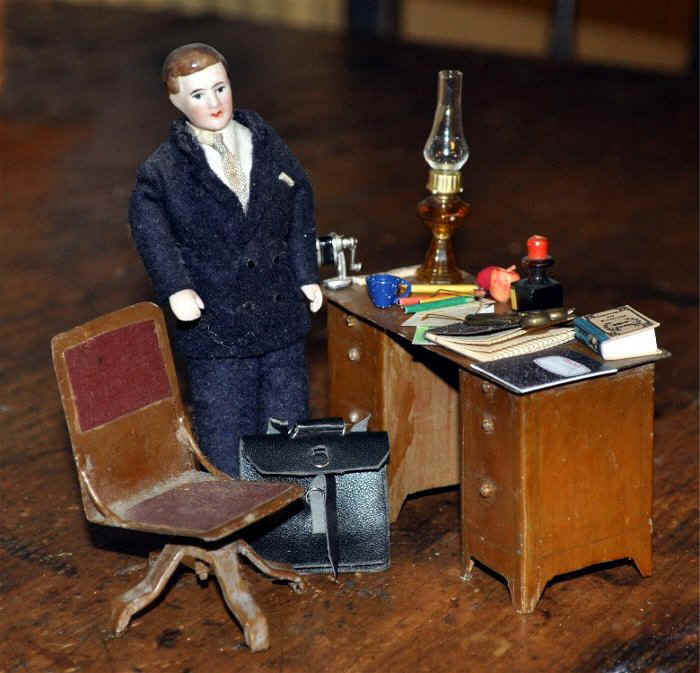 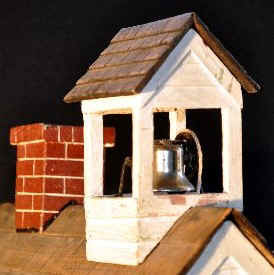 The teacher's metal desk and swivel chair came with the school house; the bisque teacher dates from the 1920s, including his clothing; the school supplies are modern. 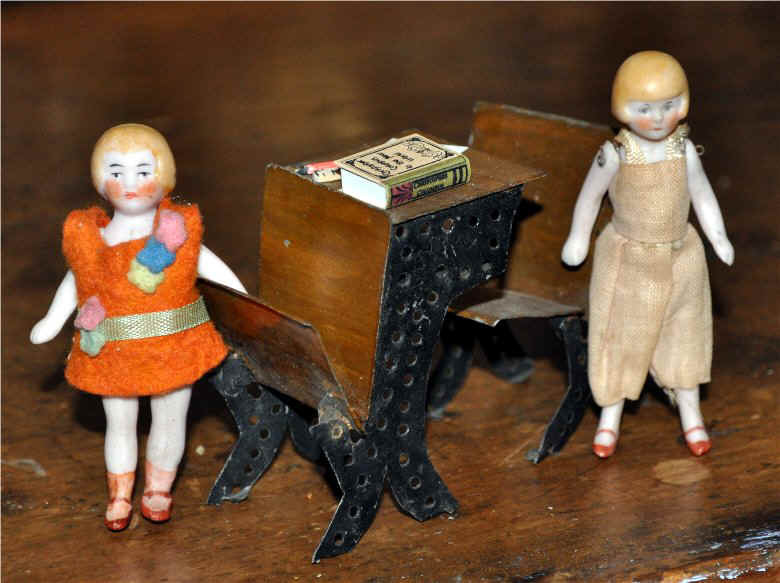 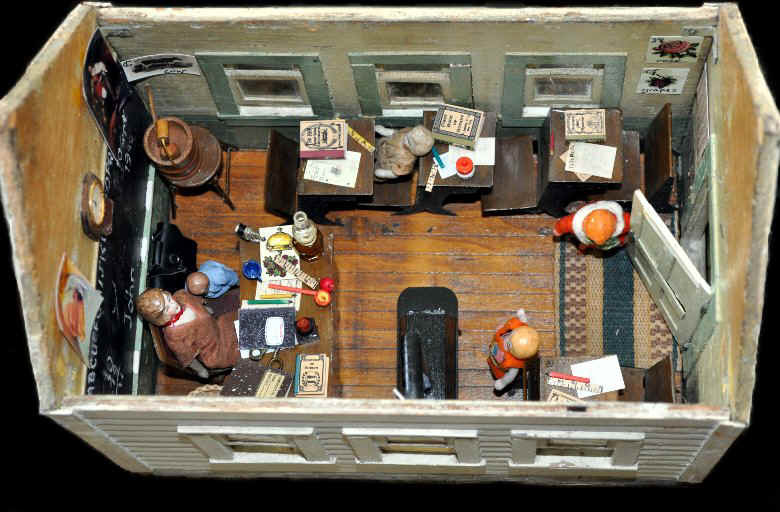 The students date from the 1920s, including their clothing; the school supplies are modern; the metal desks came with the school house. 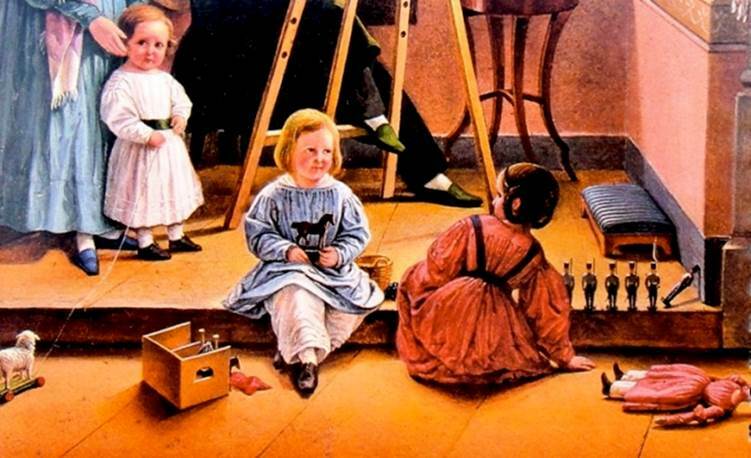 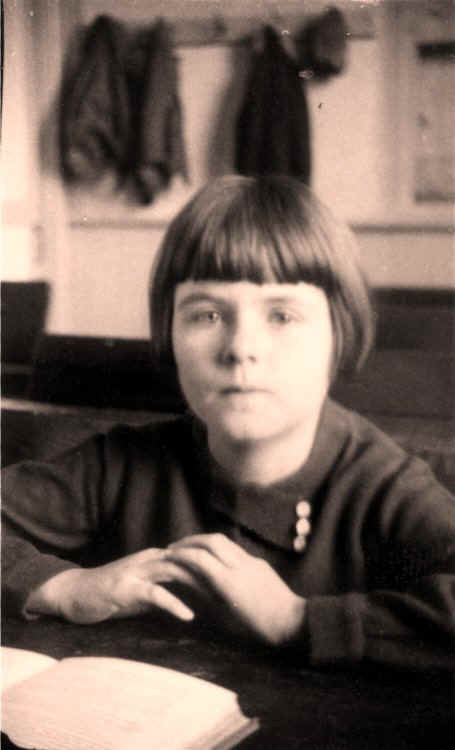 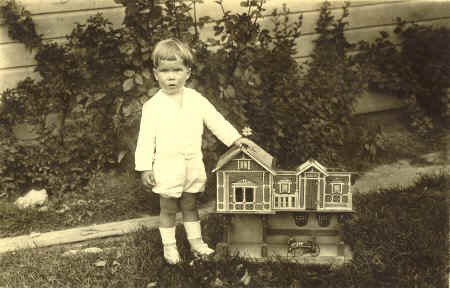 Ruth McLeod, born 1920, at public school in Ontario, Canada; note the bobbed haircut seen also in the dolls, the desks and the pegstrip on which coats and hats are hanging.